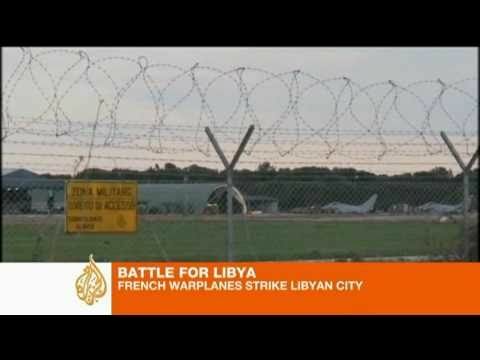 United Nations allies France, Britain and the United States took the lead Saturday evening in imposing a no-fly zone on Libya. French and British fighter jets flew dangerous missions, given that the anti-aircraft batteries of the pro-Qaddafi forces had not yet been knocked out. Then the United States launched a barrage of 110 Tomahawk cruise missiles, targeting Qaddafi’s anti-aircraft installations. Apparently this role of taking out Qaddafi’s air defenses is the primary one envisaged for the US, after which it will fade into the background and allow other UN allies to take the lead. In Paris, the Qatari foreign minister announced that Qatari jets would join the mission, but did not say when. Reuters Arabic reports that in rebel-held Misrata, which is besieged by pro-Qaddafi forces, Western fighter-jets on Saturday targeted a nearby airbase used by pro-Qaddafi forces. Two eyewitnesses in the city told the wire service that Qaddafi’s forces had fallen back from the city after the airstrike. They denied that the Western bombardment had aimed at civilian areas or fuel storage facilities. The air base lies 7 km from Misrata, Libya’s third-largest city, which is a major rebel stronghold. Another resident, Sami, said that he heard the sound of a powerful explosion coming from the airbase. He said, “Qaddafi’s forces that had surrounded the city started to move, but I do not know to where.” Inhabitants of the city are on their third day without water and many have no electricity. Lack of drugs and anesthesia makes it difficult to operate on the wounded. Qaddafi’s forces have been intensively bombarding Misrata since the no-fly resolution was passed on Friday. France sent five aircraft right away to establish a ‘no-drive’ zone south of the rebel center of Benghazi which had been besieged on Friday and Saturday. French fighter jets destroyed tanks and armored vehicles belonging to pro-Qaddafi forces, which were being used to advance on Benghazi. If Qaddafi’s forces can take Benghazi before the UN allies can assemble their air forces, he would be buying himself a lot of time and it is not impossible that he could thwart the intent of the no-fly zone altogether. The French military has clearly figured all this out, which is why its pilots are taking the risk of flying missions at a time and in places where there could still be anti-aircraft defenses. Ironically, actual anti-colonial movements such as Algeria’s FLN or National Liberation Front back in the late 1950s and early 1960s often attempted to elicit the intervention of the United Nations. In that regard, the elation of the Benghazi crowds at the UNSC resolution authorizing a no-fly zone stands in a long tradition of seeking succor from oppression from the international community. Moreover, the impetus for the no-fly zone came from the Arab League, full of what used to be called Third World states. It was tabled at the UNSC by Lebanon and supported by Bosnia, Nigeria, Colombia and South Africa. As for ‘crusades,’ it is not an accusation that can plausibly be launched against the Arab League, full of Muslim states, or, indeed, against Bosnia or the current Lebanese government or religiously plural Nigeria.